Multi-touch tables are becoming increasingly popular and much research is dedicated to developing suitable interaction paradigms. There also exist multiple techniques aimed at extending interactions into the hoverspace — the space directly above a multi-touch table. We propose a novel hover-space method that does not require any additional hardware or modification of existing vision-based multi-touch tables. 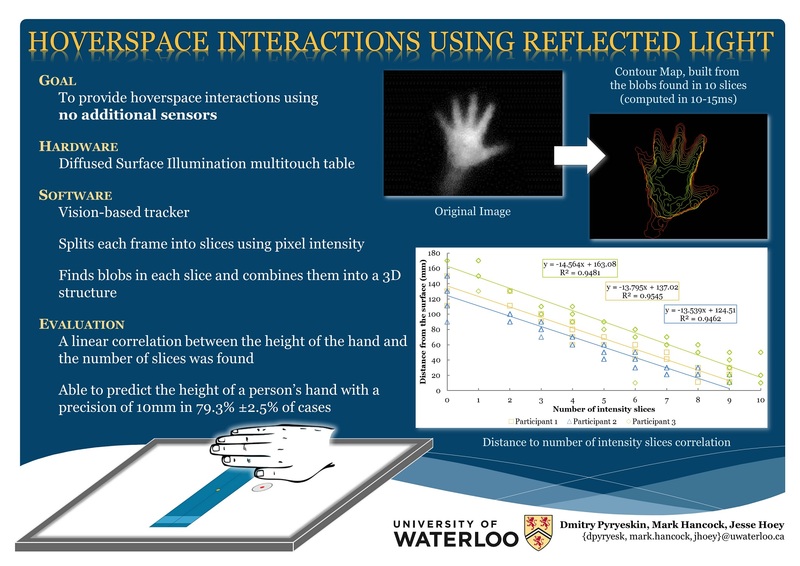 Our prototype system was developed on a Diffused Surface Illumination (DSI) vision-based multi-touch set up, and uses light reflected from a person’s palm to estimate its position in 3D space above the table. Dmitry Pyryeskin, Mark Hancock, and Jesse Hoey. Extending interactions into hoverspace using reflected light. In Proc. ITS, pp. 262-263, 2011.